Can you imagine a world free of devastating disease? Join The Jackson Laboratory and STAT Brand Studio for a morning with the researchers who are working to make this vision a reality. 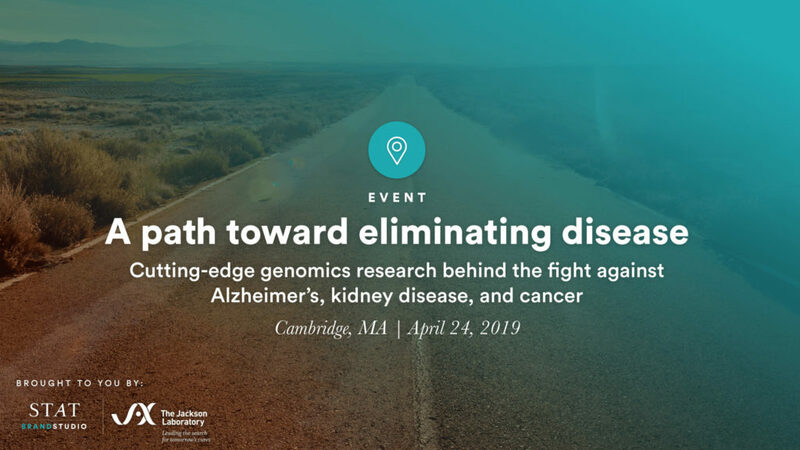 Over complimentary breakfast, we’ll hear from three Jackson Laboratory scientists who are developing ways to tackle some of our most devastating diseases – Alzheimer’s, kidney disease, and cancer. Harnessing the power of genetics and genomics, they’re aiming to transform the way we treat and even prevent many of the conditions that undermine human health today. Identifies early causative events that underlie cognitive deficits associated with ‘normal’ aging and Alzheimer’s disease. Conducts research to understand how vaccines work and to define the immune mechanisms that underlie vaccination, with a focus on cancer immunotherapies. Please contact statbrandstudio@statnews.com with any questions.